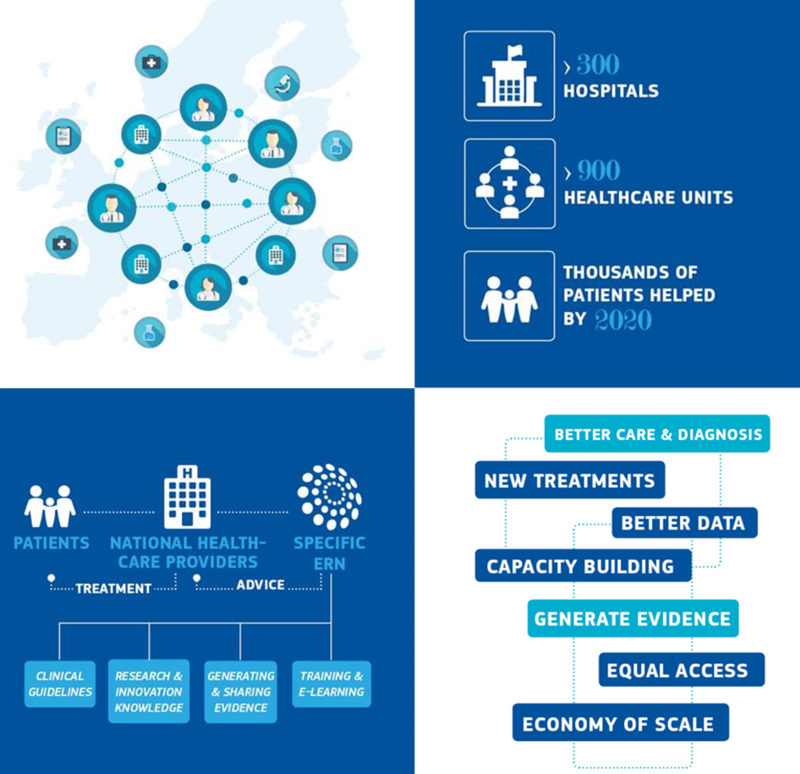 European Reference Networks (ERNs) are unique and innovative cross-border cooperation platforms between specialists for the diagnosis and treatment of rare or low prevalence complex diseases. ERNs are virtual networks bringing together healthcare providers across Europe to tackle complex or rare medical conditions that require highly specialised treatment and a concentration of knowledge and resources. They are being set up under the EU Directive on Patients' Rights in Healthcare (2011/24/EU), which also makes it easier for patients to access information on healthcare and thus increase their treatment options. In practice, ERNs will develop new innovative care models, eHealth tools, medical solutions and devices. They will boost research through large clinical studies and contribute to the development of new pharmaceuticals, and they will lead to economies of scale and ensure a more efficient use of costly resources, which will have a positive impact on the sustainability of national healthcare systems, and for tens of thousands of patients in the EU suffering from rare and/or complex diseases and conditions. The ERNs will be supported by European cross-border telemedicine tools, and can benefit from a range of EU funding mechanisms such as the "Health Programme", the "Connecting Europe Facility" and the EU research programme "Horizon 2020". The Commission has created the framework for the ERNs and provides grants and technical networking facilities to support network coordinators. However, the driving forces behind the ERNs are healthcare providers and national health authorities. They show trust, take ownership and have the most active role in the development and functioning of the networks. How can the ERNs improve the lives of patients? Between 6 000 and 8 000 rare diseases affect an estimated 30 million people in the EU. An unfortunate feature of rare diseases and complex conditions is the scarcity and fragmentation of specialist knowledge, which is often not available in the patient's region or country. Many patients therefore do not find a satisfactory explanation for their symptoms or the necessary knowledge on treatment options. By consolidating knowledge and expertise scattered across countries, the ERNs will give healthcare providers access to a much larger pool of expertise. This will result in better chances for patients to receive an accurate diagnosis and advice on the best treatment for their specific condition. Why did the European Commission develop this initiative? Cooperation at EU level makes a real difference to rare diseases patients and their families, as well as the health professionals helping them. No country alone has the knowledge and capacity to treat all types of rare, complex and low-prevalence conditions and diseases, but by cooperating and exchanging life-saving knowledge at European level through ERNs, patients across the EU will have access to the best expertise available. The ERNs are being set up under the 2011 Directive on patients' rights in cross-border healthcare. This Directive also makes it easier for patients to access information on healthcare and thus to increase their treatment options. How does the ERNs work in practice? To review a patient's diagnosis and treatment, healthcare providers/members of an ERN will consult, exchange information and share knowledge with other members of the network. Coordinators of a specific ERN can convene inter-ERN ‘virtual' advisory boards composed of medical specialists across different disciplines. A dedicated IT platform and telemedicine tools can be used for this purpose. ERNs are not directly accessible to individual patients. However, with the patients' consent, and in accordance with the rules of their national health system, a patient's case can be referred to the relevant ERN member in their country by their healthcare provider. How were the ERNs selected and approved? The European Commission ran a first call for proposals in 2016. The proposals were then evaluated by the ERN Board of Member States, which developed the overall strategy and steered the process. This board approved the first 23 networks in December 2016, and a 24th in February 2017, in accordance with the requirements defined in the relevant Implementing Decision. What medical areas are covered? The 24 ERNs will work on a range of thematic issues including bone disorders, childhood cancer and immunodeficiency. The full list of rare and complex pathologies can be found here. Will the ERNs tackle other diseases or work on other areas of cooperation? The 24 ERNs currently cover the main clusters of rare, complex and low-prevalence pathologies. At this stage, no calls for new networks are planned, but in the longer term, the ERN model could possibly be scaled-up and extended to other diseases. Aside from the diagnosis and treatment of patients, the ERNs will also facilitate research cooperation, joint trainings, knowledge generation, the development of medical guidelines, etc.